Charmaine Lane said she's earning three certificates and is already getting job offers in robotics. BURNSIDE — Mayor Rahm Emanuel and the Rev. Byron Brazier, pastor of Woodlawn's Apostolic Church of God, on Thursday cut the ribbon on a new plastic cutlery factory, but it’s already been helping people get careers working with robots for more than a year. Building Self Determination, at 9551 S. Cottage Grove Ave., on Thursday started work producing 123 million forks, spoons and knives using high-tech robots, but the program already had been training people to use the robots that will likely move on shortly after the first batch of cutlery is sold. 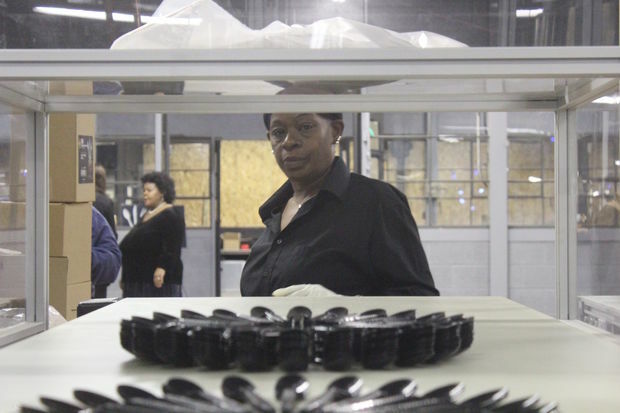 Charmaine Lane of Englewood on Thursday was packaging the 240 pieces of cutlery the plastic-injection molding machines produce in a batch every few minutes on her way to finishing up three new certifications in robotics and drafting software. Charmaine Lane was able to attend the robotics classes for free through the Apostolic Church of God and soon Chicago Housing Authority residents will also be able to go for free. She said companies already are asking her to apply for jobs, and she hasn’t even finished the program. She said she will be able to quit the desk job at a University of Chicago dorm she’s been at for nearly 20 years. And she’s expecting to make good money too, with robotics jobs starting at $43,000 a year. Lane is one of the first graduates of the robotics training program and said she joined up when Brazier announced the project in church one Sunday because she thought it would be a fun way to get back to school now that her kids are grown. “I thought I was going in to play with some robots,” Lane said. What she found was a course taught by James Kinard that tried to restructure her entire way of thinking so she could solve the problems robots face when a production line breaks down. Lane said it really has changed the way she approaches problems and helped her make a breakthrough on understanding math and physics 20 years after her last lesson in either subject. She said she was elated when, during the classes now taught on the Chicago State University campus, she finally got the programming right to make a model stoplight turn on — only to be deflated again that she still needed to get it to light up in sequence. “It was such an amazing feeling; I had a blast,” Lane said. Nikki Bravo, vice president of human resources and workforce development, said the program is connecting grads with employers and is also helping to burnish resumes and fine-tune interview skills so graduates have some of the softer skills necessary to get a job. Lane was able to do all of this for free because Apostolic Church of God paid for its members accepted into the courses to attend. CHA residents will also get to take the courses for free thanks to a deal that provided a $2 million grant toward starting the programming and its factory and a partnership with Chicago State University that makes sure the courses count as college credit. Bravo said the program is geared toward people who have a high school education or a GED diploma and may need help juggling school, another job and kids at home. For more information, visit the Building Self Determination website.